Recognized as a reference in matters of research on the absolute safety, the Swedish manufacturer Volvo presents us his latest creation, the pedestrian airbag. Seven sensors, a technology avant-garde and an airbag that deploys in the area of ​​the windshield at the speed of lightning. This is the essential constituent items of the pedestrian airbag technology, thanks to which system Volvo Car Corporation became the first manufacturer in the world has to offer, the new V40, a pedestrian airbag. In China, pedestrians represent 25% of deaths in traffic. The figure is 14% in Europe and 12% in the United States. The number of pedestrians injured is much higher. In accidents involving cars and pedestrians, injuries to the head are the most serious conditions caused by the rigid structure situated under the bonnet, the lower edges of the windscreen and the amount A. These considerations, among others, are at the origin of the development of the pedestrian airbag technology at Volvo Car Corporation. Advanced majeure, the system was a world first launch of the new Volvo V40 in Geneva earlier this year. "We are proud to offer a vehicle equipped with an airbag for pedestrians. This airbag is intended to contribute to the protection of pedestrians in certain situations when they hit the hood, the area around the wiper blades at rest and pillars, all elements with a risk of serious injuries head, "says Thomas Broberg, safety expert at Volvo Car Corporation. September implanted sensors in the front of the vehicle transmit signals to a control unit. 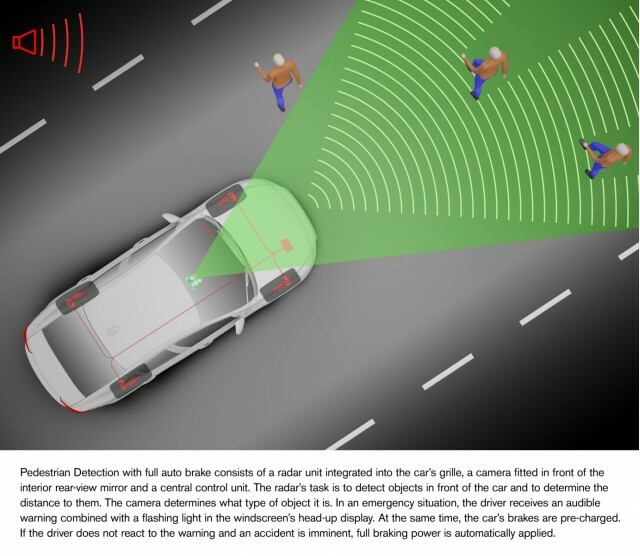 The entrance of the car in contact with an object causes an alteration of the signal, the control unit evaluates; if she interpreted as corresponding to the leg of a human being, the outbreak of the pedestrian airbag is then active. The hood hinges are each equipped with a pyrotechnic ejection mechanism of which is the activation of the system liberates a pin to liberate the back cover. Simultaneously, the airbag triggers and fills with gas. During the inflation sequence, the airbag raises the hood 10 centimeters which is maintained in this position. The extra space between the bonnet and the rigid parts of the engine compartment leaves enough room to cover for it to deform, thereby generating a damping effect when it hits the pedestrian. "The airbag has a dual function. First, it raises the hood to create a distance; secondly, it dampens the shock around the rigid parts of the area near the windshield, "says Thomas Broberg. Once inflated, the airbag covers the whole of wiper blades at rest, about one third of the windshield and the lower portion of the amounts A. The full sequence of activation of the system in total inflation is place in a few hundredths of a second. The device is operational between 20 and 50 km / h. 75% of accidents involving pedestrians occur below 40 km / h.
"We developed this technology through computer simulations and members of anthropomorphic dummies. The tests were carried out in a wide range of configurations, "says Thomas Broberg. The airbag itself consists of a bag and a hybrid gas generator. At the moment of tripping, the bag fills gas in milliseconds. 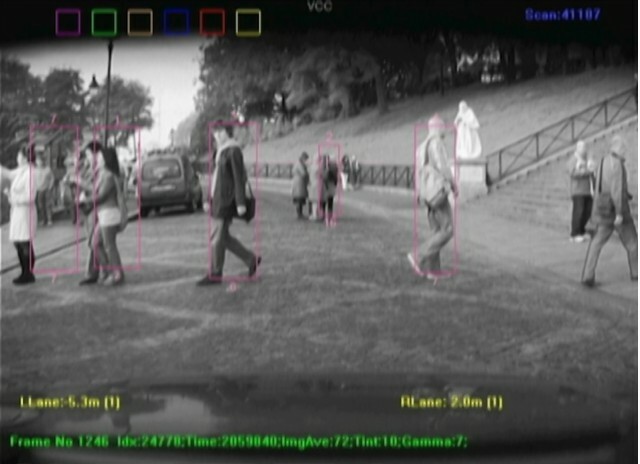 Two years ago, in 2010, Volvo Car Corporation has launched the Pedestrian Detection with Auto Brake has full power. The system allows, in the absence of reaction of the driver to avoid a collision with a pedestrian up to 35 km / h. A superior speed, priority is given to the maximum deceleration of the vehicle before the impact.